A bicycle trainer stand is a device that enables you to ride your bicycle while it is stationary. This device typically clamps onto your rear axle allowing you to ride your bike without it ever moving. This is quite ideal if you don’t want to limit your time riding or practicing due to time schedules and weather conditions. A bike trainer is a great value buy if you are in training or have a regular exercise schedule. It allows for year round rounding indoors. 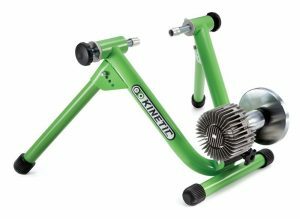 Wind Trainer: The wind trainer is not commonly used much anymore. This type of trainer stand uses wind power generated to provide resistance on the back tire. 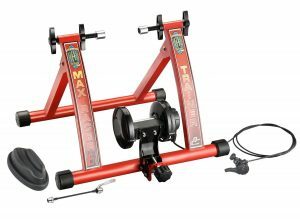 Mag Trainer: This trainer is a bit more money however, it is a whole lot more quieter than the wind trainer. The mag trainer uses a magnetic device to create resistance on the rear wheel of the bicycle. 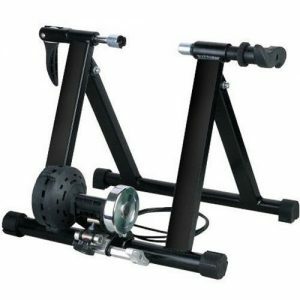 Fluid Trainer: This combines a magnetic flywheel wheel with fluid resistance. It’s quite quiet however, it can be a bit pricey. Tire Size And Bike Style: When you are looking for a bike trainer stand it’s important to know your tire size and bike style to find the right trainer for you. There are many different brands that will fit various bikes from mountain bikes to road bikes and everything in between. Front Wheel Anti Slip Pad or Riser Block: You will need to find a trainer stand that has either anti-slip pads or a solid riser block for your front wheel in order to maintain stability while riding indoors. If it has a good anti slip pad or riser, it is well worth the money. Stable Platform For Stand Up Riding: Some trainers will have the right platform that will allow you to ride not only sitting but standing up. Easy Storage: You might not always have your bike out so it’s a good idea to find a trainer that can easily be stored away. Some trainer stands will actually fold so that you can save space and store more easily. Quiet Operation: You probably do not want a trainer that is very loud and may disturb others. Look for a bicycle trainer that says it has a quiet operation and check reviews to see what customers say. 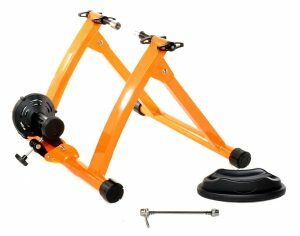 The best bike trainer stand for a beginner will be easy to put onto a bicycle and easy to ride. When you are starting out you never want to get something that is complicated to use as you learn it. This trainer stand is compatible with bikes that have 26 in., 27 in. or 700c tires. It has a wide frame that gives added stability, which is perfect for a beginner. It also is a heavy duty, well built stand that will hold in tact very well. This bicycle trainer includes the front wheel riser block and also folds for easy storage. Overall this is a perfect stand for beginners at a great value. It’s also quite important to find the best deals out there when shopping for a bike trainer stand. The ability to ride indoors all year doesn’t not have to be expensive. In fact, you can find an affordable indoor stand that is well worth the money. This bicycle stand is made of durable steel and is a great mag style trainer. It features 5 resistance settings to maximize your riding. It also folds easily for storage and easy travel. This quiet operation trainer stand works well with 26 in., 27 in. and 700c tires. If you want a well-built trainer stand that is affordable this is a great brand to try. 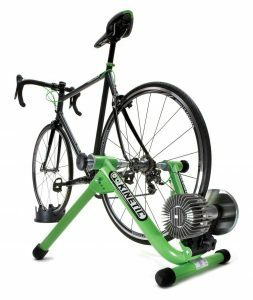 If you are willing to spend a little more on a trainer stand for your indoor riding but you don’t want to go over $500 there are several different options. This one below is one of the best for the money. This indoor bicycle trainer by Kurt is quite versatile and efficient with its well-built magnetic system and automatic resistance changes. This trainer has an authentic feel so although you are riding stationary indoors, it feels as though you are really riding your bike! For under $500 this is a really great bike trainer stand. Some bike trainers work well for road bikes while others will also work well for a mountain bike. 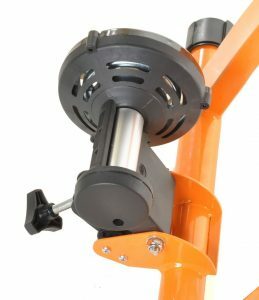 It’s important that you get the right bike trainer stand for your style bike at price that you can afford. This mag trainer from RAD Products gives you the freedom to ride your mountain bike indoors all year, despite weather conditions outside. It’s very easy to set up, fold, store and transports. This works well with most mountain bikes including tire size 26 in, 27 in or 700c. This bicycle indoor trainer stand also features quiet operation so that you are not disturbing anyone else in your home or area. Overall this is one of the best brands of trainers for mountain bikes on the market. You will love how easy it is to set up and ride. Whether you are a beginner or a pro, having a trainer stand will give you more freedom to ride whenever you want despite weather conditions or your busy schedule. The above brands and products have great reviews and are well worth the money if you are looking for a sound product that is durable and beneficial to you.